For Registry-Registrar Amendments to include the approved Temporary Specification for gTLD Registration Data please refer to this page. 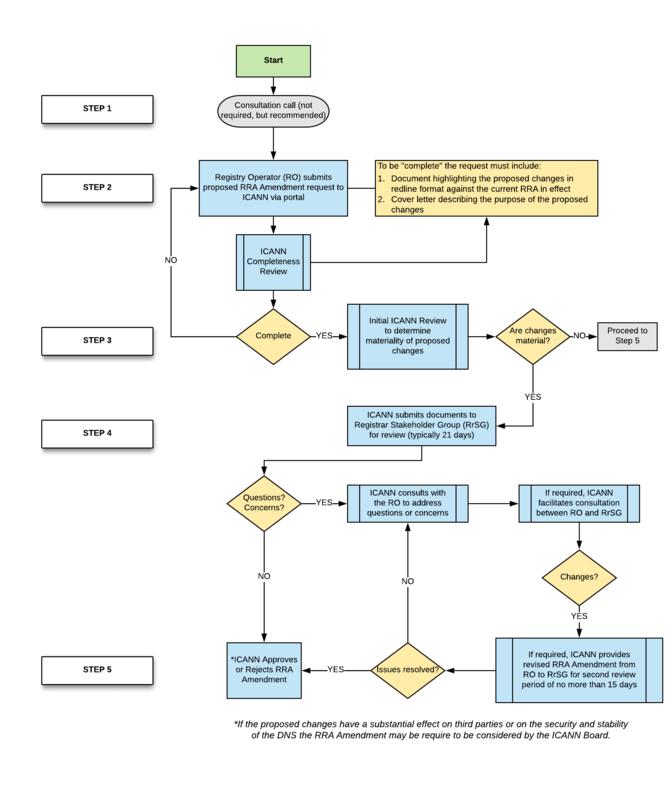 ICANN has developed the following process for consideration of proposed amendments to gTLD Registry-Registrar Agreements (RRAs) where the registry is required to obtain ICANN approval of such amendments. This process is designed to ensure registrar input (and public input where appropriate) before ICANN approves changes to an RRA. The registry requesting amendment to its RRA must provide ICANN with a copy of its proposed RRA that indicates all changes in redline and a cover note. The registry-provided cover note should describe the purpose of the proposed changes. Although not mandatory, a consultation call with ICANN prior to submitting proposed changes to the RRA is recommended. ICANN will forward the redlined version of the proposed RRA and cover note to the Registrar Stakeholder Group for review while ICANN undertakes an internal review of the proposed changes. The length of the registrars' review period may vary depending on the complexity of the proposed changes or other circumstances, but will ordinarily not be longer than twenty-one (21) days. ICANN will ordinarily publish the proposal and cover note on its website. At the close of the registrar review period, if there are any concerns expressed, ICANN will consult with the registry and with the Registrar Stakeholder Group to attempt to resolve any such concerns. If the consultations result in changes to the proposal, ICANN will submit the revised document to the Registrar Stakeholder Group and open an additional review period, which will normally not exceed fifteen (15) days. Upon conclusion of any second review period, ICANN will attempt to resolve any remaining issues through consultation with the registrars and the registry. Following the above review and consultation process, ICANN will approve or reject the proposed changes. Some changes may require approval by ICANN's Board of Directors e.g., in cases where there might be a substantial effect on third parties or on the security and stability of the DNS.